Today a pair of gloves is not only to keep your hands warm from cold conditions but also to protect your fingers and hands from the certain accident. MTB gloves have changed the narrative of hand gloves with its anticipated benefits. Now biking gloves become an integral part of mountain bike riding after the helmet. It is one of the most important safety equipment that every biker should own. Mountain bike gloves not only provide typical cold-weather protection but also ensure safety from the unwanted injuries to the mountain bikers. 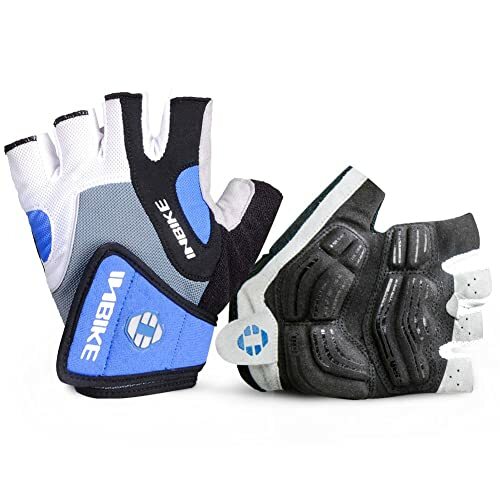 Mountain bike gloves equipped with great rubbery and gripping palms which provide you full control over handlebar whether riding in humid or wet conditions. It protects your hands from crush and keeps dry to have better grip and don’t slip off bars. It also gives better control over slip while you make turns on the trail. Again, when you need to wipe out the sweat from your face during the ride or to go out for a long ride, your sweaty palms or rain can make your handlebars grip slippery. In this situation, without gloves, you are at risk to have injuries and need some protection for your hand. Fatal skin injuries can also occur if you throw your hand onto the surface without an adequate protective glove. Wearing a pair of biking gloves allows you to break fall with your hands to prevent other parts of the body from dangerous injuries. Best MTB gloves also protect your hands from debris, impacts and vibrations as well as keep the skin on your palm if you crash. It also allows you to stay safe from hurting your painful blister. 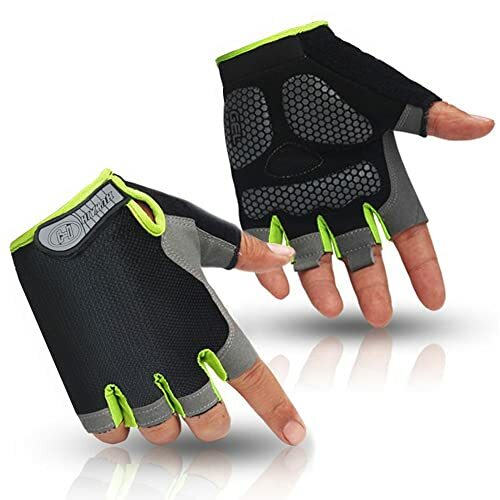 There are many bike gloves available on the market offering the different level of protection; this phenomenon makes it difficult to choose the best pair of gloves. To help you decide the right one, we have created a selection of the best MTB Gloves and summarized their features with their pros and cons. Zookki full finger gloves are fashionable and designed in a way that it can be used for cycling, road biking and mountain biking too. It comes along with perfect design and quality materials that make your hand feel comfortable. Each finger of your hand suitably fit with this glove whether your hand is big or small. It keeps your palm safe and protects your hand in both hot and cold conditions. It allows you to touch your smartphone screen without facing any problem. The most impressive feature about Zookki cycling gloves is that it contains silica gel pad in the palm which works as a buffer layer to keep palms well-padded and to absorb the shock and impacts that comes with riding. The palm pad is very thick and comfortable that it provides the ultimate gripping capabilities on the ride. You need not worry about palm as it is skip-proof and hard wearing. The thumb is made with terry cloth design that makes you able to sweat off of your forehead to avoid stinging eyes. The top side of the gloves is made of the mixture of mesh and stretchy fabrics which provides flexibility, durability and well ventilation to your hand which is needed for an unobstructed bike ride. It also features a reflective layer to increase the visibility that let the cars to see you during biking on the road at night. The inside layer contains unique fabric which is designed for moisture wicking that your hand doesn’t get too sweaty and also covered your blisters as well. It also features an infusion of micro leather that is tough and built to last. This gloves also have a strong Velcro wrist closure that any size of this glove fits well and provides a snug and comfortable wearing to hand. Zookki is designed to provide you bunch of padding, compression and support for all sorts of sports. This quality gloves not only improve riding comfort but also increase the overall sense of clothing indeed. Inbike cycling gloves feature both flexibility and durability which is very important that a pair of good gloves needs to have. This is a gel padding cycling gloves which are the great fit with plenty of padding in the palm. Inbike gloves are made of Lycra and mesh. Lycra is durable as well as flexible and meshes provide adequate ventilation. The mesh top doesn’t let the hands get too hot or sweaty during riding. This is a half fingered glove which offers excellent ventilation and also provides good protection to your hands. It features 5mm thick padding on the palm which adds a layer between your palms and handlebars to absorb the shock and impact of riding. The top layer of the palm is made of non-slip silicon substance to provide grip for a solid bike experience. It is very convenient to use. Its moisture absorbing terry cloth layer between the fingers helps to wick away moisture and sweat off your forehead. A simple Velcro wrist closure helps to provide you snug and adjustable fit to your hands. This glove is designed to make you get good feeling and protection after cover it on your hands. It also makes you feel breathing free and stylish yet. Fox Racing glove is a full finger mountain bike glove which is ideal for all-day rides. This glove made of a long-lasting material which provides you an unprecedented amount of grip between hands and handlebars. It features a double layer Clarion palm for maximum grip and a decent amount of gel padding to keep your palms comfortable. It’s silicone grip fingertips never let you slip off of those handlebars during biking. The top of the glove is made by lightweight and flexible material that prevents your hands from getting too hot or sweaty. It also offers an absorbent micro-suede thumb which acts as a kind of towel to wipe your face and to keep sweat out of your eyes. It provides a Velcro wrist tab closure that provides a secure and snug fit to your hands. This is a performance-oriented pair of gloves that always remain supportive and comfortable. HTZPLOO bike gloves are the best reliable companion for the cyclist. It provides strength and enhances potential at the athletic level. Its effectiveness puts enough courage and confidence to you on riding. This glove is made of 55% polyester and 45% nylon. It offers an anti-slip silicone gel palm which increases your grip and helps you to control the handlebars more sensitively. It features shock-absorbing padding protection to relieve hand fatigue and reduce road vibration. This is a lightweight glove which makes your hand less burden. Its 100% area of palm gives a firm grip on the bar that enhances the flexibility of the rider to avoid vibrations and injuries on the riding. The top side of the glove is made of lycra materials which conforms your hand shape to give you skin like feel. This glove provides two little fingers loops that help to pull off the gloves without turning them inside out. It also offers an absorbent towel cloth on the thumb to wipe out the sweat. 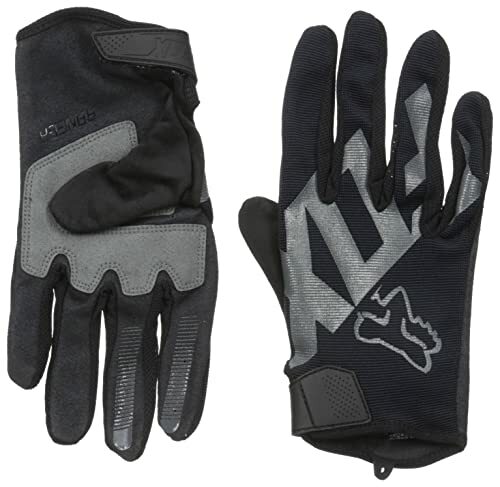 Its adjustable Velcro closure gives you a snug and comfortable fit to the hands. It also provides comprehensive protection for racing cycling indeed. A little bit bulky in size. 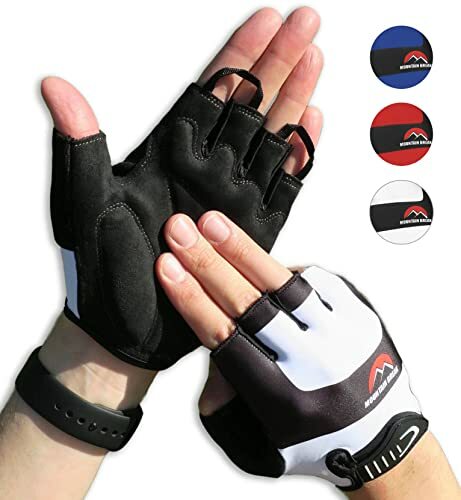 Mountain break glove allows you to use this bike riding glove on your other sports activities. It offers you all the features of MTB gloves as well. It is made with high elastic Lycra fabric and high elastic knitted mesh fabric. This combination provides high breathability and firmness to your hand. It features shock-absorbing foam in 3 zones to reduce vibration and convenience of finger pulls for easy removal. This half finger glove keeps your finger free for better gripping of your handlebars. It provides a sticky Velcro for a comfortable ride. If you in need of a versatile glove then it is an excellent option for you. You can use this glove for all your activities as well. Usable for all sporting activities. People may find insufficient padding for tougher rides. HuwaiH half finger cycling gloves are great for both men and woman who are looking for an anti-slip and durable glove. This glove can be used for both shorter and longer rides as well. It is made with highly elastic Lycra fabric and knitted flexible mesh fabric for breathability. It also contains three thick, durable gel palm for shock absorption and non-slip wearability. The terry cloth on thumbs is designed to wipe the dripping. Its silica gel pad can absorb the shock and reduces the probability of skipping on riding. Palm also works as a buffer layer. Its finger pocket tabs make it easy to take off. This pair of gloves allows a close and comfortable fit through their velcro wrist closure. These gloves are designed for sports lovers. It reduces numbness on the bumpy road effectively. This is a quick drying as well as washable gloves indeed. 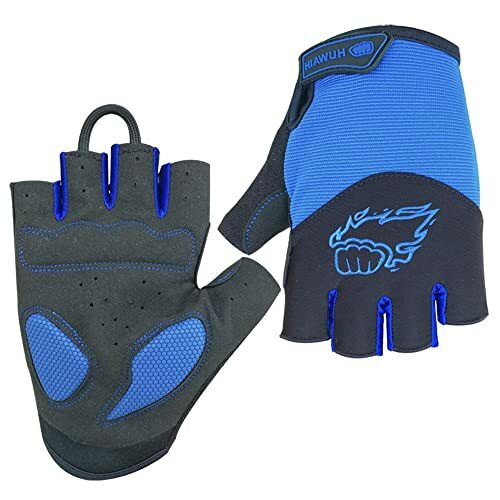 HuwaiH cycling gloves is an anti-slip shock absorbing pad biking gloves which are usable for both men and women. It is made of high elastic polyester and lycra fabric. The palms of this breathable gloves contain thick, durable structures with non-slip silicone. This silica gel palm work as a buffer layer which reduces the probability of skipping riding. The terry cloth design on the thumbs is used to wipe out the sweat. Finger pocket loops designed to make it easy to take off the gloves. The Velcro wrist closure makes it convenient to use. Mesh cloth, Lycra fabric and sandwich mesh cloth on the surface provide breathability to it. The gel pad can absorb the shock as well as reduce the numbness on the bumpy road effectively. 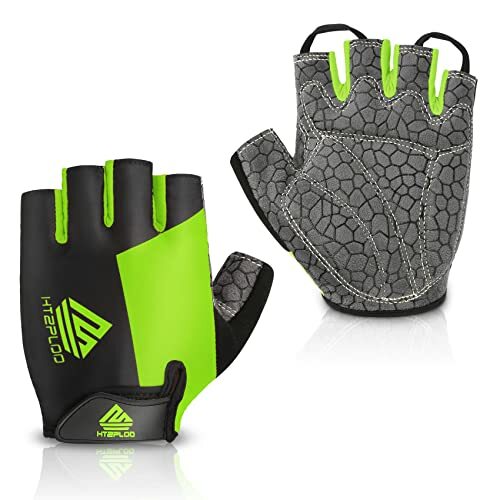 This glove is specially designed for sports lovers and breathable performance. Gloves run a little small. When cyclists are facing unavoidable accidents, they naturally use their hand to support the ground. If your hands are not protected then injuries caused by high speed is unimaginable. To avoid these certain accidents, there is no alternative to wearing gloves. Cool change cycle glove is a half finger glove which has a large area of SBR pad to protect as well as support your hands. The thumb area contains terry cloth to wipe sweat to avoid danger. These half-finger gloves have the loop on an index and middle finger to take off the gloves easily and quickly. 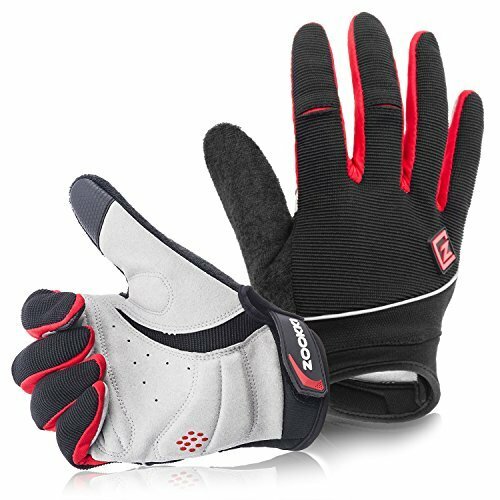 This biking gloves also fit for cycling, gym, mountain biking, hiking, boating and fishing as well. This glove can be washed by hand. Hot water, bleach and acid wash is forbidden for it. This bike glove is a little bit tight, so it is preferred to go one size larger than the size you usually wear. To relieve your hands from numbness in a long ride this half finger gloves works excellently to solve the numbness greatly. This is highly slipping resistant and great gripping to prevent your hands from skidding. This glove with breathable fabric also provides cool and fresh feelings in spring, summer and fall. The glove is a little bit tight. 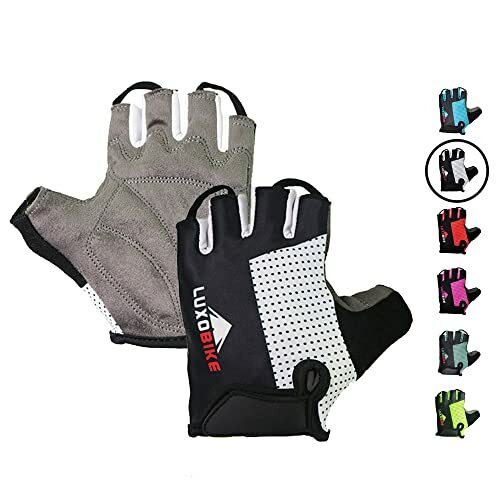 LuxoBike cycling gloves is a breathable anti slip half finger sports gloves which can be used by both men and women. It contains 4 zone shock pads which absorb vibrations and reduces pressure on the nerves to minimize the risk of injury. This pair of glove includes suede palm which provides maximum grip and stability to the hand. It also offers soft absorbing thumb towel cloth to wipe out the sweat. It provides a streamlined Velcro pull tab closure for a custom fit without compromising comfort. This is easy to take off finger loops to relax after the ride. This is so comfortable that you might even forget you are wearing them until you get to the end of your ride. Foam material padding, not gel padding. This is an ultra-thermal and windproof glove with fleeced lining and lengthened wrist hook and loop fastener, tightly keep wind outside and lock the warmth inside. This gel padded glove contains three pieces gel pads and superfine palm fabric which makes it breathable and shock absorbing while biking. The inner of this glove is made of 90% polyester, 7% microfiber and 3% nylon fabric. This is a full finger touch screen glove which can access to your smartphone without taking off. These microfiber fingertips with silicone grippers provide anti-slip performance. This is a stylish glove which goes with both men and women. These gloves can easily be adjusted to the hand. This glove in 4 different colors constructed for extreme weather protection and warmth. It has a reflective ribbon on the back which increases the visibility of winter night riding and also works as a caution effect at night. This warm glove is best suited for winter cycling, biking, skiing, fishing, and mountaineering as well as outdoor activities. Choosing best mountain bike gloves becomes easy when you know what to look for. We believe gloves that looks good, breathe well, fit snug and washable are the best options. Here we provide you some criteria that you need to consider while purchasing a pair of cycling gloves or biking gloves. Armed with this information you can precisely figure out which pair will work best for you. Breathability refers to the amount of air that can exhaust from the glove. It helps to keep your hand sweat less and dry to enjoy a comfortable riding even after hot weather. It provides more flexibility in movement. Protection is the vital part that needs to consider while purchasing gloves. Best biking gloves provide leather protection pads on the palms as well as provide extra protection on the knuckles and backs of the hand. Again, some gloves also offer grip pads on the finger trips. A high-quality glove also provides bracing at the wrist to protect from breaks during an accident. Warmth is a crucial factor for the winter riding. Winter gloves offer some extra layers to keep your hand warm and dry while riding in cold conditions. Wicking refers to the material ability to move sweat away from your palm skin to keep your hand warm and dry. Wicking ability helps to get rid of the slippery which occurs due to sweat. Though half finger gloves suit best for the summer riding, full finger gloves provide better protection and excellent control over handlebars than half finger gloves. Along with quality and materials, caring is also an essential thing that ensures the longevity of biking gloves. Gloves require caring as like as other kit and gears. Dirt clogged up the materials of gloves and makes them smelly, so we need to clean them regularly to keeps them breathable and odorless. Winter gloves also require waterproofing spray treatment after every few months. To keep your waterproof kit in good condition you always need to follow washing instruction to avoid shrunk and lose of waterproofing. MTB gloves are the essential accessory for a safe and smooth ride. Though every hand is different, so what works for one might not work for another. A good pair of biking gloves is not too much chunky and too skimpy. It not only keep your hand warm in cold conditions but also keeps you comfortable in hot conditions too. In summer, sweaty palms and rubber grips can be slipped all on a sudden. 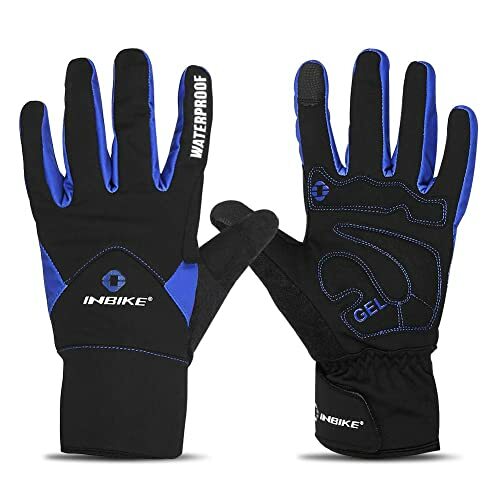 Biking gloves are highly versatile that they can keep your hand warm and dry by removing your sweat away from the skin. Considering many factors, we have narrowed ten best MTB Gloves among the best bike gloves based on the major features that riders want. All these recommended gloves are currently available in the market. 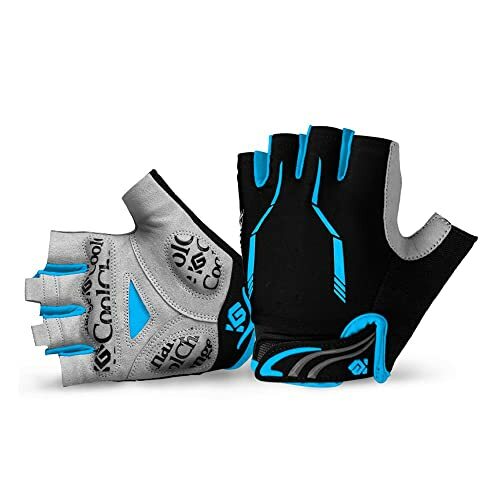 We are confident that one of this above gloves will work best for your bike riding needs.